Green Mountain Troutfitters: Cold Water Window Closing. It's bassin' time! Cold Water Window Closing. It's bassin' time! The trout fishing has been stellar this week, but the window of cold water is closing fast with 80+ degree air temps all week! The Lamoille has already jumped up considerably, measuring 69 degrees this afternoon in Jeffersonville! That means it's time to find colder water or to shift efforts to warm water fish. 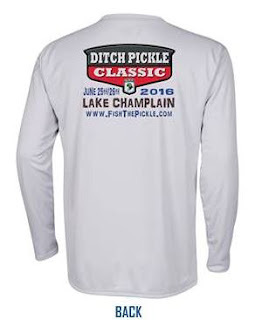 Speaking of warm water fish, we have over 130 anglers already registered for our catch-photo-release tournament on Lake Champlain, the Ditch Pickle Classic! If you've not been a part of this event, you should be! Check out the video above for a glimpse into Team Hook Shots trials and tribulations in the 2015 DPC. If you are already registered, hopefully you're building up your fly arsenal for the big weekend! We've got loads of locally-tied patterns and all the materials to tie them as well in stock, so come check us out. Check out the new design we threw together for our custom DPC Tunaskin shirts! Every angler that fishes the DPC gets one of these beauties included with their entry fee! Not to mention all the other swag from our sponsors that is also included for just $50! Check out www.FishThePickle.com for more info and get your team together soon!